Every few months I’m bound to give you another taste of Ranchos Church, officially San Francisco de Asis. This one happened just moments after the sun fell below the horizon behind me, bathing the church in a divine glow. The magic light is cast so evenly over the adobe skin that it reveals every blemish and vein of the mud and straw. The soft shadows seem to caress the church's famous buttresses. Good shot, Steve. Good words, too. Must admit, though, I'd like to see it in color, as well. Stunning!! 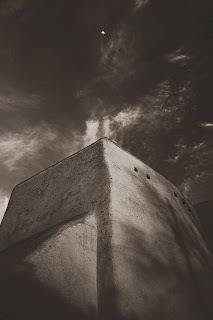 I am so hooked on your photography and you can never shoot the Ranchos church enough. That place has so much to offer. I love driving through and I love walking around there. Ha! I see John also commented. Color, huh? I'll explore the archives to find the original shot. Color, of course. Awesome photo! I love the faint shadow of the cross against the side of the church --it gives the message that here is a place of worship. I agree that Ranchos has a lot to offer in Photography!! You da best! Many thanks Marcia. How's tricks?